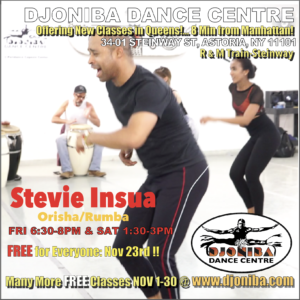 Don’t miss this amazing FREE Cuban Rumba/Orisha Dance Class taught by Stevie Insua at Djoniba Centre @ RIOULT Dance Center. 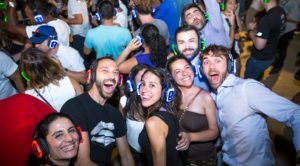 Enjoy the rich heritage of Afro Cuban Folkoric dances. The class is designed to teach students the movement, style and characteristics of Yoruba, Palo, Orishas, and Congo while gaining an awareness of the accompanying rhythms.